← Asking questions. Making choices. This entry was posted in Assessment and tagged assessments, grades, rubrics. Bookmark the permalink. The problem here is not with the categories as numbers, but with the school culture that insists that x% is a B, no matter what it is x% of. In many college classes, tests are designed so that the median score is 50%, with a standard deviation around 25%, so that the test maximizes the information about the students. There’s not really much point in asking a lot of questions that everyone will get right or everyone will get wrong—if you want to know how students are doing, you want questions in between those extremes. Perhaps if you called your categories A, B, C, D, F, they would be easier to explain to parents. Why do all recently trained teachers avoid using those category names? Well said. I went to a presentation by Thomas Guskey and he made a point about how much electronic grading programs themselves actually dictate how we grade. Since then I’ve been aware of how often I or another of my colleagues have said something like, “I can’t do that it won’t fit in the gradebook, ” or “Yeah, but how will that fit into the gradebook?” No point to this comment other than to say, things are screwy. Thanks for directing me here after reading my comment over on Mr. Meyer’s blog. I completely agree with what you are saying here. I actually tried one of your above mentioned standards-based grading scenarios a couple of years ago (readjusted grading scale percents so it looked like B students were getting 75% – not the best thing to have done). While I understand that standards-based grading doesn’t equate to the traditional percentage grading system, I guess I’m trying to figure out a way to bridge the gap since I currently use a percentage grading scale. I don’t really want to change my whole grading policy that I already submitted to my principal and parents months ago. I’m just having a hard time wrapping my brain around a combination of standards-based and percent scale grading without running into conflicting reports of what the students actually know and what their “grade” says they know. I’ve been dealing with this issue for the last two years. There were two of us (now five) using SBG in a prep school with 40 teachers. You can imagine the outcry after the first progress reports. Our gradebook (Easy Grade Pro) allows you to set a grading scale, so I went with something along the lines of 50% being the middle of the C’s, 75% the middle of the B’s, and so on. The kids and parents caught on about mid-way through the first trimester. If I had my way, we would just take the percentages out. Wait, if I had my way, they wouldn’t every be averaged, but that’s another issue. BTW, I’d like to hear you opinion of Canvas. We’re thinking about switching. I agree with everything you have here except for the 0. The 0 continues to be a number with HUGE impact. If you keep to your scale couldn’t you assign 50% or 55%? It seems completely disproportionate to assign 100, 85, 75, and 65 then 0. A 50 or a 55 would still be a failing grade without causing Unicorns to fail due to one missing grade. In many college classes, tests are designed so that the median score is 50%, with a standard deviation around 25%, so that the test maximizes the information about the students. There’s not really much point in asking a lot of questions that everyone will get right or everyone will get wrong—if you want to know how students are doing, you want questions in between those extremes. I’d hesitate to concede this is how it works in many college classes. In some, for sure. But my experience in mathematics departments at several wide-ranging types of institutions suggests that this attention to assessment design is actually quite rare. I would also argue that there a lot of different reasons for giving exams. If a teacher views the most important information to be gleaned from an exam to be have these students learned this material?, then she’s gonna design a very different exam from the one she’d design if she viewed the most important information to be what is the correct rank ordering of this class of students, according to the amount of material each has learned? Couldn’t agree more with Jason‘s assertion that electronic grade books constrain teachers. And, unlike at the college level, those grade books are often mandatory in K-12. Krystle, thanks for making your way over here. And thanks for asking that question again over in Dan’s house. I’ve had this one chambered in my mind for months now. It took seeing someone ask the question again to get it on paper (as it were). Theron, start here for my views on Canvas. I’ve got much, much more to say, so don’t hesitate to ask-here, Twitter or by email (gmail, really: mathematics.csd). And Laura, I’m down with your argument. I’m at the college level and have relatively few big things that get graded during the semester. In my situation, turning nothing in is pretty unacceptable, and 0’s really are reserved (in my scheme) for things that are missing or off-task. So I’m comfortable with 0 being 0%. But I dig that systems need to adapt to contexts. The key for me is the part where we say to ourselves, “I want a score of X to mean Y, so I’m going to Z” If you’re doing that, I’m not going to argue with you about what Z is. I’m afraid you’re right that many college professors pay no attention to assessment design. I remember tests that were so easy that a couple of tiny mistakes moved one’s grade a lot, and tests so hard that getting anything right was a pass and two questions right was a superior performance. Generally engineering faculty take a more pragmatic view of testing than other faculty, and the 50% median is more common in engineering courses than other branches of academia. I see the purpose of a test is to give you information about about how the students are doing. From a purely information-theoretical analysis, questions with a very low or very high probability of being answered correctly provide very little information. To get information about all levels of students in a class, you want a mix of difficulties, so that there are a few questions that challenge even the top of the class and few that separate students near the bottom of the class. Of course, there are other uses for tests than gathering information. They can be used for certifying competence, for example, in which case you want questions whose difficulty is very close to the certification threshold. A test designed this way can give a very clear pass/fail signal (more reliably than a test designed to give information about all levels of students), but is nearly useless for any decision other than pass/fail. The common middle-school test policy aiming for a median of 80–90% is based on the assumption that getting answers right on a test helps students learn (by bolstering their confidence). But all the research I’ve seen indicates that students learn more from what they get wrong, so even from a pedagogic standpoint the common practice makes no sense to me. I was just thinking about this today! So glad Dan Meyer posted a link to this. Took a long hard look at the numbers and felt like I was going nowhere (and getting there fast) with rubrics. I will attempt to throw the original numbers away (so hard for a math teacher) and formulate better judgments based on categories! Katie, we do aim to please here at Overthinking My Teaching HQ. And yes, Serafina, it is hard for us math folk to not treat something that looks like a number as a number. But remember, this is a halfway measure-you’re still getting to numbers, and once you’re there, you can do with them whatever you like. The other thing to consider about numbers: Are you scoring actual learning or the pace of learning? I may have to reteach a concept 3 or 4 times before a student understands. In the end, if a student can independently demonstrate knowledge of the concept, the student meets expectations. I believe it is my responsibility to make sure every student meets expectation on every standard. Those that meet expectations right away should be challenged to exceed expectations based on pre-determined criterion. It’s tough to manage, but worth the effort. For me, numbers are not about grading, Numbers are for assessing in order to inform future instruction. And don’t get me started on extra credit, which is just as pernicious and pervasive at a 2-year college as in public K-12 schools. Ahh… refreshing to see others dealing with these inconsistencies. I have used a similar system with my rubrics that satisfies me and basically turns a 4 into an A, a 3 a B, etc. When scoring the assignment, I allow myself to overlap categories, like circling both a 3 and a 4 for a paper that exceeds the criteria for proficient, but doesn’t quite excel: resulting in possibilities of halves. I also reserve the right to award a 4.5 to a paper that is perfect in every way, and maybe even better than mine. Then I double the ‘score,’ add 11, and take the final result out of 20 points. 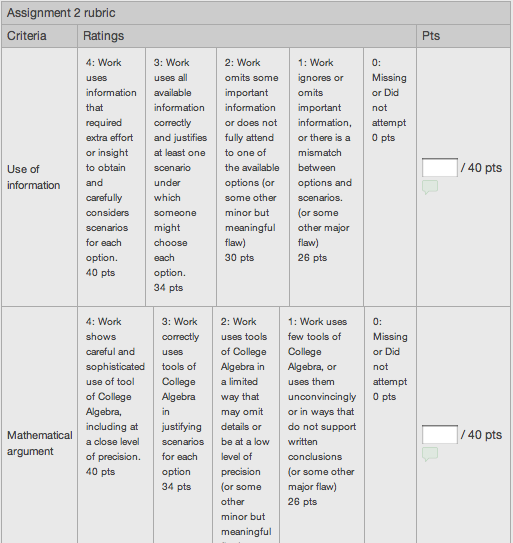 Contrived, I know, but in this way, the rubrics translate effectively to my gradebook system, the weight of 20 points sits nicely with how I want each assignment to be weighted overall, and the categories work out nicely to correspond with a parent’s traditional idea of assessments. You’re killin’ me, Emily. There is a lovely breeziness to your description of the computation you do. And I just love the problem-solving aspect of this. I really think about pretty all of teaching as problem-solving. The hard part, often, is putting our finger on the problem. My curriculum is broken down into about 36 outcomes (about 9 per quarter). For each outcome I collect evidence on the students’ learning. This includes homework, classwork, exit tickets, tests, activities, etc. Once we are done with that outcome I take a look at the evidence and “grade” the student based on three levels: High Performance (H), Proficient (P), and Not Yet Proficient (N). If the student is less than 70 percent proficient, then their grade is that number. For example, if a student is proficient in 6 out of those 9 outcomes, then they have a grade of 67%. I don’t care about their high performance. For example, if a student is proficient in 8 out of the 9 outcomes, and high performance in 3 out of the nice outcomes, then he is 89% P and 33% H. Add those two numbers together to get 122. Look at the table and 122 point converts to 88%. It takes some getting use to, but I love that I no longer put number grades on an assignment, I now leave comments instead. The students get so much more out of this and they want to correct their mistakes. One last thing: The one level is called Not Yet Proficient for a reason. My students are allowed to submit more evidence throughout the year to prove their proficiency on an outcome. It gives the students more control over their learning and grades. Again I am one where this conversation came at the right time…the end of the quarter. I like what you are doing…I was trying to come up with something similar…I have 12 Skills in Quarter 1 and was going to try and make a chart of some type to show all of the possible outcomes (5 point scale) where I can determine the letter grades for the report card. Your method seems to make more sense. However in your example you stated you had 9 outcomes and a student was Proficient in 8 of the 9 and also high performance in 3 of the 9 and then you added the percents together and so on. If there are only 9 outcomes, can a student be proficient and high performance at the same time for one outcome? I took my 5-point rubric from Kate Nowak. It goes something like this: 0-absent, 1-nothing redeeming, 2-something in right direction (still clueless), 3-has a clue (major conceptual error); 4-more than a clue, but made an error; 5-got it. I give a 2-3 for no work shown with a correct answer. I take the sum of the last 2 scores, not the two highest. I feel this has been pretty representative of the students ability (and retention) so far this year. I don’t allow anyone to pass if they have a sum of 6 or below on any concept. They have to reassess and get up to 7 (which means they probably have more than a clue). Concepts are cumulative and they will roll over to the 2nd and third trimester so they can always improve, and I am giving cumulative midterms and finals (w/ notes allowed). So far, I like my new plan, the reassessments aren’t killing me, yet. I’m in my third year of SBA and I’m loving the conversation here! The biggest thing that gets me thinking in this thread is that even as we try to let go of the numbers in the rubrics… I still see people trying, at some point, to get to a formula and a percent to get a grade. When I approach SBA I look at all early scores as ways to inform students, parents, and myself of where the student currently is, and where he/she needs to get to.I do not use them as factors in the final grade. I agree with earlier comments that the level needs to be about where the student lands at the unit/semester/year. The part of SBA that has been most freeing to me, is that when grading time comes, I let go off the formulas and percents and use my professional judgement to assess and “grade” students. My true dream is one day not have to assign a letter grade- to simply send home a list of the 7-10 big topics covered in the term with the rubric level for each. (Obviously, I don’t teach high school, where the credit for graduation issue reigns supreme). Anyway, since I DO have to make a letter grade at some point I tell my students this- An “A” means you have mastered everything we’ve learned. The most recent collections of evidence I have on any given topic from you in this term show mastery on every standard. If you have any level below mastery, in the MOST RECENT evidence I have collected…you will not earn an “A”. A “B” means you have mastery in most of the topics, but there are a few where you have given evidence you are very close to mastery. Your mistakes are small and evidence shows you have an understanding of the topic… it’s just not consistent yet. etc, etc. In other words, I have a rubric for the final grade as well, instead of a percent. As wishy-washy as that sounds, I have huge buy-in from students. It takes some time and training, but they get what I’m looking for at each level. It’s been an extremely interesting journey- but student’s conversations have changed over time. Students now ask me how they can practice and master specific topics in order to bring up their grades, instead of asking how to get more “points”. They know that not one topic can be ignored- that even if they are above mastery in some topics, that doesn’t “cancel out” or excuse knowledge in another topic. I love it. So I say, step one- let the rubric levels be rubric levels on individual assignments, but step two- also let the formulas go when it comes to summary judgments and end of term grades. Just ran across this today from a Twitter link. (I guess I have not “read back” far enough on the blog.) So much to discuss! If there were 5 standards included in the grade, and a student received four 4’s and a 1, their overall percentage (assuming equal weights on the standards) would be 460/5 = 92% which seems awfully high for someone who totally doesn’t understand one of the five targets. At the other end of the spectrum, a student could not meet standard on ANY targets and still pass! Even by converting to more “equitable” percentages for 4-3-2-1 (rather than 100-75-50-25) the “averaging” is still in effect. Gradebook programs are “not our friends” when it comes to SBG. They will spit out an average or a percentage even when you dont want them to! I record scores as 4-3-2-1 in the grading program, but do not use them for calculating grades. Still, the score shows up with a percentage that I can’t turn off. Students are concerned that their 3 is a C, even though they know the rubric. I was able to use symbols to indicate the level of achievement with our previous system, but I haven’t found a way for it to work with the new one. I really like where you are going with this 5 point scale. I like that they have to keep their skills sharp and they can fluctuate by taking last 2 scores and averaging them. I am sure this is possible with Google forms. I am exploring SBG with multiple blog posts. I am going to start by mapping out my CCSS Math 8 standards into a concise list of skills and reference sample CPM problems from text as part of the work and links to practice. I like that you are bringing up the 0 situation and am not surprised your school implemented a policy. I like the 4 point scale adjusted to the percent ranges and using 3.5 and 2.5, etc. That can get a tad messy.